You can get all the parts needed at your local hardware store. If you have to buy a full length of PVC, then your per-gun cost will go up, so make two for you and a buddy and consider it money saved. Cut your 2" PVC, and drill a 1" hole in the 2" cap. Assemble without cement. Then examine your test plug. Ours came with a washer on top that was larger than 2", so we replaced it with one that was smaller. The washer that you replace it with should be around 1.5". Too small and the squeezing action of the test plug wont work as well. After you've sized and ensured the washer is good, disassemble the plug. Drill a hole in the 3/4" cap sized for the bolt of the plug. The bolt is a carriage bolt, and if the hole is sized tightly the carriage end will have enough material to grip to on the cap. 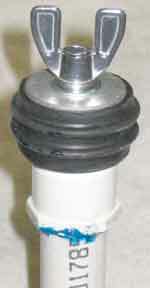 If it's drilled too large, the assembly may spin without tightening the plug. Assemble the cap and plug as shown here, then ensure you've got it working. Next cut your 3/4" PVC to the length you feel is the most comfortable. We suggest 33", but it's up to you. 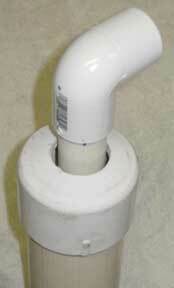 Using PVC cement, assemble the 3/4" pipe to the plug assembly. Slide this into the 2" pipe and check that it is comfortable. You will be pulling the handle up very high, check if that is comfortable as well. When you're satisified with the length of the 3/4", add your elbow for a better grip. You could also add more pipe out the other side for a larger handle if you wished. BUY a SLURP GUN aka GHOST SHRIMP PUMP aka YABBIE PUMP! If you want to save the hassle, buy a pump from us that's ready to use for just $39.99. Will ship world-wide, please email first for rates. Shipping to US addresses $10. Once you buy your own, you can call it a yabby pump, slurp gun, or sand shrimp gun, or even mud shrimp pump -- whichever you like! No extra charge! You might even say it's a "multi purpose" tool! > Click to Buy a Pump Now!